Much has been said about Rich Iott, the Republican candidate for Congress in District 9, Ohio. But, has anyone said anything about this photo of Senator Mary Landrieu? Maybe instead of Mary, it is Robin Carnahan. Or does it look more like Hillary Clinton? Could this be Blanche Lincoln? WAIT! Is that Debbie Stabenow? Come to think of it, that kinda looks like Kay Hagan, to me. But, she does kinda favor Claire McCaskill, too. Dang, I forgot which one of them this was. Lemme see, heavyset, LATINA....hmmmm. Heh! I actually wouldn't classify Katrina Mary in the Nazi crowd. As much as I disagree with her on almost everything, I don't think I'd go that far. Of course, she is blond haired, and blue eyed (I think blue eyed, but maybe not...probably green, or brown). And honestly back in the day was quite the looker...I mean 30 years ago. I think that's more likely a wise Latina woman in that there shot. Doesn't the frozen facial expression give it away? It's a dead ringer for Pelosi! I must agree with Andy -- Mary's a know-it-all, but not quite a Nazi-grade know-it-all. And Blanche is from the Delta in Arkansas. 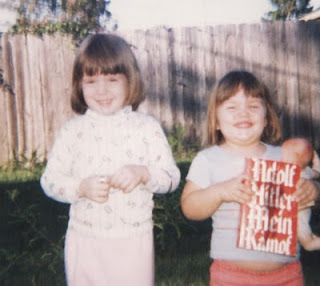 I don't think the Delta allows Adolph Hitler books around its schoolchildren. Sometimes I think it doesn't allow most books around its schoolchildren. You could be onto something about the wise Latina, though -- that does appear to be a Spanish-language edition . . . .